In Leviticus 19:1-18, 31-37, we get another restatement of parts of the Ten Commandments and the Book of the Covenant. The emphasis here is on love of neighbor. 2 Speak to all the congregation of the people of Israel and say to them: You shall be holy, for I the Lord your God am holy. 3 You shall each revere your mother and father, and you shall keep my sabbaths: I am the Lord your God. 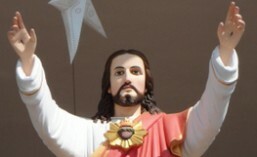 4 Do not turn to idols or make cast images for yourselves: I am the Lord your God. 5 When you offer a sacrifice of well-being to the Lord, offer it in such a way that it is acceptable in your behalf. 6 It shall be eaten on the same day you offer it, or on the next day; and anything left over until the third day shall be consumed in fire. 7 If it is eaten at all on the third day, it is an abomination; it will not be acceptable. 8 All who eat it shall be subject to punishment, because they have profaned what is holy to the Lord; and any such person shall be cut off from the people. 15 You shall not render an unjust judgment; you shall not be partial to the poor or defer to the great: with justice you shall judge your neighbor. 16 You shall not go around as a slanderer among your people, and you shall not profit by the blood of your neighbor: I am the Lord.